The American Public Transportation Association released a report documenting Millennials and their mobility needs. The report shows the decline in driving among Millennials and helps shed some light on the implications of this trend for public transportation in the United States. According to the report, Millennials are multimodal which means they choose the best transportation mode based on the trip they are planning to take. The report highlights public transportation modes in five cities most populated with Millennials. In these cities, most Millennials rely on public transportation because of its convenience and environmental factor, the ability to digitally socialize, and the cost. While the trend to use public transportation is rapidly growing, the industry itself needs to be keen on what Millennials want, this way they will keep coming back for more. Millennials crave inexpensive modes of transportation due to their high levels of debt and low levels of income. One respondent was quoted as saying, “My generation is strapped financially … we’ve acquired $50,000 to $100,000 in student loan debt–it forces us to start our adult life in debt … All this makes my generation need to be a bit more creative on how we get around town.” In response to this, public transportation providers need to be able to find ways to keep the cost of commuting down, while providing other key factors to attract Millennials. The workforce is changing, and Millennials are leading the charge. Work has become something that is done in and out of the office; with some people working during their commute. 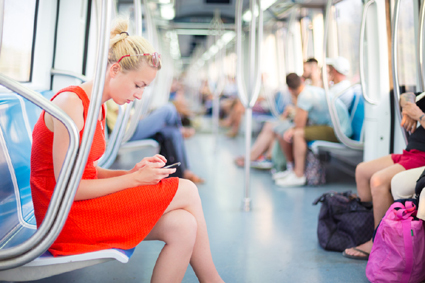 Being able to connect with digital resources and accomplish work while traveling is a growing trend and it is also an important benefit of public transportation. Millennials are using public transportation because it gives them a chance to connect with their peers, digitally. Most respondents (54 percent) said that they would like to see better 3G/4G or Wi-Fi service during their commutes. They also requested more real-time updates—which they can check from their smartphones—to help them avoid long waits and delays. For Millennials who live in the city, public transportation is more convenient and better for the environment. City living allows for convenient modes of transportation due to the close proximity between home and work. More than half of the people questioned for the report used public transportation when commuting to and from work. The environmental impact is important Millennials as well. One respondent said, “Our generation grew up knowing all about the effects on the environment that cars can have, so we've grown up with an attitude of wanting to do our part for the Earth—something that we can easily do with public transit and not with cars.” Millennials do their part for the Earth by using public transit, but they also see the benefits in other modes of transportation as well. As more and more Millennials enter the workforce, this trend is likely to grow larger. Companies and organizations should be aware of this trend so they, too, can maximize on the full potential public transportation has to offer city dwelling Millennials. By offering public transport incentives, companies can do their part for the environment, while retaining and attracting this younger generation! For the full report, visit the American Public Transportation Association website.